HP and the Monkey Act! A short story but a long similarity with one of the most respected technology companies in the world: Hewlett Packard.HP has forever been caught on transition (it seems) with no strategy or long term thought on the way forward. There are many other examples of companies and boards that have been profligate and have squandered away all investor faith and confidence: Nokia, RIM, Yahoo and more.. and HP is certainly not the worst. It has managed to erode only about 50% of its market capitalization in the last 2 years or so, which is pretty neat. 1. So everyone wants to be Apple. But there aint no Apple No.2. HP failed to understand its own core proposition and went on the “ape” route. 2. Needless to say all of the HP smartphones and the touchpads found no takers. The markets already had Apple and Android to content with. If ever there was a third front, it was Microsoft. 3. Did HP’s BoD and Lee Apotheokar assume that mobile market to be simplistic enough that a Palm WebOS purchase would suffice? Ever since HP took over Palm, Palm and WebOS got more sidelined than ever. 4. After buying out Palm for 1.25 bln and the $1 bln restructuring cost booked in Q4 2010, the effort has been a drain on the resources and a massive let down for the shareholders. 5. Then came the announcement that HP is moving away from hardware business to software and consultancy focus.Many call this restructuring and I call that an IBM cloning. 6. Surprise! Surprise! Today morning newspapers report that HP actually doesnt want to sell it PC business now. About turn from stated strategic intent less than a month or so back. 7. Beat this then, when HP wants to side with Windows 8 for tablets! So Apothekar buys out Plam and WebOS and outlines a grand strategy for WebOS. Now CEO Meg Whitman does the boring and sundry and wants to get back to Windows 8. Venturing into Mobile (and moving out), Buying WebOS (and failure to Leverage), Moving out of hardware and coming back to it. The question begs to be asked; Does the HP board know what is it that it is driving at. Or is it the monkey act in between all the chaos and confusion that tech industry always is. Would Amazon gamble on Palm WebOS? Could HP’s loss be Amazon’s big gamble? Yes we are talking Palm’s WebOS. Amazon, the online retailing giant is rumoured to be in serious negotiations to snap up Palm from HP. So while HP is currently looking to rid itself of Palm as soon as possible, Amazon is reported to be the closest to finalizing the deal, among a handful of contenders. It’s worth noting that former Palm CEO Jon Rubinstein, who now holds a vague “product innovation” role at HP’s Personal Services Group, joined Amazon’s board late last year. Amazon’s Kindle Fire which is loosely Android based (loosely based because of the heavy customization by Amazon to the point where one can barely tell that it is Android.) could use WebOS could provide the necessary differentiation to Amazon Kindle devices from the slew of Android tablets. There’s still plenty of potential for WebOS to power a successful device. Palm’s mobile software was praised for its slick multi-tasking capabilities, which could allow future Kindle Fire tablets to juggle games, movies and media with more finesse than Android. … we’d (Palm) like a partner that would allow us to expand the webOS ecosystem… There’s a variety of different sets of a characteristics to qualify as a good partner. I would say Amazon would certainly make a great partner, because they have a lot of characteristics that would help them expand the webOS ecosystem. As to whether there’s been discussions or not… that’s obviously not something I’m going to comment about. On a personal level, I had expected HP to do a whole lot more with its Palm acquistion. Instead all it produced was the ousting of Lee Appothekar and a radical change of corporate strategy. I do hope Amazon with its best in class revenue generating streams could use the Palm WebOS’s abilities and UI to far greater effect and success. Even as iOS, Androids, WP7, Blackberry 7, Symbian and more are engaged in a bloody battle for supremacy in the OS space, Palm-HP’s WebOS, hasn’t really been the feature in any discussion and HP seems content at WebOS’s MIA status. Why would one be concerned with WebOS in the first place? That’s because Fanboys world over have been debating that the WebOS is the true blue competitor to Apple’s iOS in a digitally connected world. How can one compare an iOS that has an installed base of more than 10 million devices and has enabled 10 billion app downloads to a rookie OS which is yet to hit the road. More so, research agencies such as Gartner donot feature the WebOS as a sizeable competitor in forecasts up to 2015. HP has already launched new generation WebOS products such as HP Veer, Pre 3 and Touchpad. The specs of Pre 3 and Touchpad are frighteningly close to the bests in the competition. So what might the success factors for WebOS be? 1. WebOS is as optimized as it gets for touch screen devices and was built ground up for touch devices. That puts it beyond the reckoning of Symbian and BB already. This puts it in par with the iOS. 3. Sharp features on the UI such as Cards (instead of home screens) to group apps. Again at par with iOS. 4. The WebOS will be cloud ready at launch and the Synergy feature would automatically back up data on the cloud eliminating the need of a synch. 5. Touchstone features such as bump to share and induction charging would be other differentiators in the pack. 1. Absence of an ecosystem to support the app hungry users. By the time, WebOS surfaces, developers would be more engrossed in Apple, Android and WP7 to cause a crisis of quality apps for WebOS. 2. While Palm has some presence in US, the game is to step it up world over and though HP has the muscle, this may take longer than expected. The WebOS could be a huge threat to incumbents such as BB and Symbian. Even Android with its issues of fragmentation could feel the challenge from WebOS. With its bells and whistles, WebOS actually closes on the king, iOS and while many have written the WebOS off, it could really be the fight of this decade between WebOS and others going forward. HP needs to get the launch dates and pricing right…. When Palm unveiled the WebOS for the first time, it was hailed by many as a true competitor to the iOS. However WebOS lost its way with Palm and the HP acquisition of its parent. The WebOS, incredible as it was, was thought to be done and dusted with.For HP, acquisition of Palm as to accelerate their position in mobile phone space, but it was also about webOS. Now, when HP is seriously mulling smartphone options, it has started resuscitating the WebOS from the dead. Call it WebOS 2.0 if you have to, but knowing Palm’s smartphone penchant, there is some promise the WebOS holds which could possibly be just enough to give HP the toe hold in the smartphone melee. 1. HP is also hinting at using flexible display technology (refer to FOLEDs) as an important ally. We already have hints from Sony, Samsung and Apple who are already working in the direction of flexible displays. 2. Palm’s online, drag-n-drop development Ares system is a versatile set of integrated mobile development tools hosted entirely in the browser. The Ares features a drag-and-drop interface builder, a robust code editor, a visual debugger, and built-in source control integration. Ares dramatically lowers the barriers for web developers to jump into mobile development and makes building webOS apps even easier and faster than before. 3. HP is also working on application frameworks “Enyo” (Mojo as known earlier), to support apps on multiple form factors. In consonance with Ares, Enyo packs in faster performance, modern and modular design and support across a range of products and screens. 4. Palm also has started wooing developers, inviting them to work on the Enyo framework for design and creation of Apps. While the Mojo is already available,Enyo SDK access program is expected to kick of early 2011. In over 170 countries globally, HP has atleast 10% of consumer electronics shelf space and Palm and the WebOS are going to be two critical factors that will help enhance HPs presence in the shelf space. WebOS is not only the centerpiece of HP’s mobile vision, but also enables HP to extend WebOS across more products and multiple regions. HP seems to be buying a route into the mobile phone market with its purchase of Palm, but it could also plan to emulate Apple’s strategy with tablets and other media devices. On one end, the takeover could just involve a change from a Palm that’s struggling in the smartphone business to a Palm with the cash (and the resulting market confidence) to create a successful smartphone business. On the other hand, the acquisition could mean that HP could be more interested in owning its own operating system across phones and mobile devices (and being free of Microsoft in those areas), much like Apple. 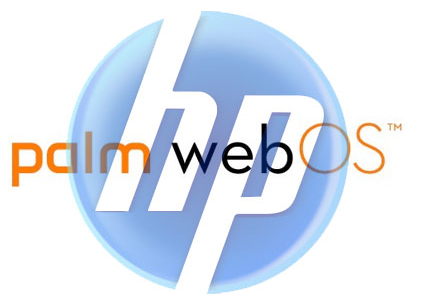 Web OS certainly holds a promise as far as HP is concerned. Yet another view is that HP needs a strong presence in mobile, but Palm doesn’t deliver that. This acquisition is of critical importance to both Palm and HP for the synergies that it gets to the table. If HP didn’t have the right products to become a smart phone player, Palm didn’t have the money to compete with Apple and RIM in the US market and to make the brand known outside its home market. This deal takes a good operating system to the right hands and to the next level. HP’s purchase of Palm shows a clear intention to enter the consumer mobile device market. HP brings financial strength and broad reach; Palm brings a set of consumer-focused hardware, OS, application store and intellectual property. HP has made a clear commitment to invest in Palm’s technologies and has hinted at ambitious plans that go beyond smartphones. But neither Palm nor HP have a strong presence in the consumer market. 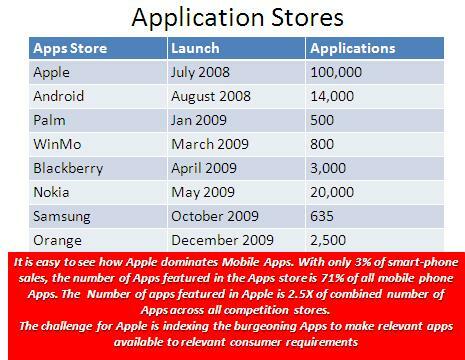 Most significantly, they lack momentum around mobile application stores and a developer ecosystem. It will take time for HP to build up such an ecosystem, and it faces extremely strong competitors like Apple and Android. The consumer smartphone market moves quickly and HP will have to act fast. In the short-term, the impact of this deal will be felt in the US market and Nokia will be one of the most affected players. When a company has a good product and the money for marketing activities, it creates a problem for its competitors. With money to invest, Palm will be able to leverage its brand, broaden its portfolio, and provide carriers with the money they need to sell devices. Money brings success if you have the right product, as Palm has. Palm’s survival no longer seems to be a problem, for the time being. In an earlier post, I had discussed the crisis at Palm and the inability of the leadership to acknowledge, identify and address the crisis. So what makes Palm a good purchase for its likely suitors anyways? Palm has to its credit a few strong assets that make it a very viable and in demand purchase. WebOS, the Palm patents and an ex-Apple talent is what drives interest in Palm. The depth and quality of a patent portfolio is somewhat correlated to the time a company has been in an industry and the extent to which it has held leadership positions, which is presumably when it might have sewn up some key patents. In fact for the WebOS, It is the devices: Pre and Pixi that is constraining the software and the device is a lot easier to fix than a poor operating systems. Just think of how long it took Palm, Apple, Google and now Microsoft to develop their new mobile operating systems; years. That’s where the interest in purchase of the Palm lies. 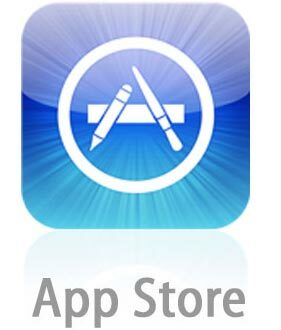 There is also the App Catalog to consider. With Palm’s recently released PDK they have probably the best gaming development platform after the iPhone, but again for this to get serious traction with developers they need to believe in the viability of the platform, which is unlikely as long as Palm remains independent. The case for the talent is pretty much self evident. From an acquirer’s perspective, everyone that might be interested in Palm knows they could be very close to needing life support and waiting for the point at which they will need resuscitation could be very costly. They also know that there has got to be more than one other party interested in acquiring Palm so they can’t sit simply bide their time before they make a bid, lest they lose the company to another bidder. (A case in point is Admob on who Apple dawdled for a while only to see it acquired by Google and Apple ultimately had to take a second choice option). Then there is the time to market issue. There are quite a few OS’s in development and Android and the iPhone are leaping ahead; no buyer has the luxury of sitting back to wait and see how things play out if they want to compete. Palm is sinking… if stats had their way. However, the CEO and Chairman refuses to accept the facts on his face. Palm is sinking and from the looks, it doesnot look like it has more than 12 months left to it. The “white knights” if any are few and far between. 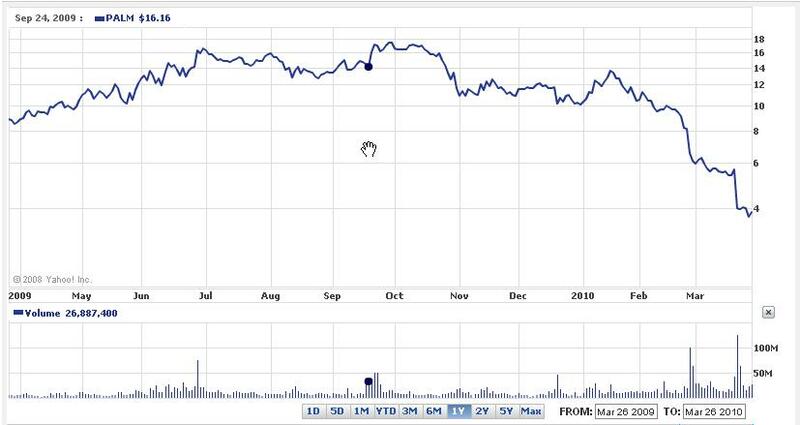 Palm reported quarterly revenue $350 million earnings with a net loss of $18.5 million; sending the stock on another nosedive to around $4.These results are after adopting the new accounting rules that let certain companies accelerate revenue recognition. The Palm share price has eroded by 75% in an year. A sad statistic of how the smartphone maker is gasping for oxygen and life. One reason for Apple’s bang-up last quarter was the accounting rules change. All it did for Palm was to keep things from looking even more dismal. The cash-on-hand picture will only get worse.Out of the 960,000 units that Palm moved into distribution, only 408,000 actually sold through to customers. The next quarter revenue estimate is expected to be lesser than $150 million. The announcement of Palm and Pre for AT&T is a positive, but with competition from Nexus One and iPhone 4G, one would be cautious about nets on Palm and Pre. WebOS was supposed to be a silver bullet, but it isn’t, because consumers simply don’t want to buy Palm’s products. Current products have been eclipsed in hardware terms and new competitor hardware is on the horizon. No amount of marketing is going to make the products sell well against the coming competition. The recovery from a crisis begins with the identification of the problem and there-after the solution. The way it looks for Palm, they have not yet defined their problem in the first place. Forget looking for solutions. The April – June 2009 quarter results for Apple and Nokia are the literal “study in contrasts”! The numbers do justice to the sentiment towards both these companies at this time. Apple is clearly shinning bright and is the toast of the bourses.